It is an early start for 42-year-old Magdalena Urbano Blas. Every weekday morning, her alarm clock goes off at four o'clock. She prepares lunch for her two children, 10-year-old Diego and Viviana who is about to turn 15. She kisses them goodbye and her father walks her to the bus stop. Her journey to work as a house-keeper involves three buses and takes two hours from her home in the south of Mexico City. 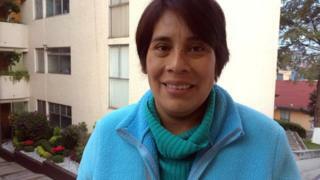 Magdalena works eight hours a day, cleaning a wealthy family's apartment and looking after a toddler. After work, she makes the long journey back in the evening, only to start all over again before dawn the next day. For Magdalena, this is better than it has ever been. She earns $90 (£60) for a 40-hour week - and gets paid overtime. Compare that with when she started, aged 13. Her first employers paid her just $4 a week. Magdalena says they taught her everything she knows. They encouraged her to finish primary education but they were tough. She was so badly-paid, she could not afford rent. So she lived in a neighbour's unoccupied room on the roof of the block of flats she worked in. Instead of rent, she paid her way by ironing for the neighbour. It was a hard existence but nothing compared to the difficulties she faced in her last job. The family she worked for had several houses, one of which was being renovated. There were dozens of workers there - gardeners, carpenters and electricians. One day, her employer told her that an electronic device was missing. "We looked and looked and it was nowhere," says Magdalena. "But as I was the person in charge of looking after the house, I was held responsible - they accused me of stealing and fired me." Her employers sent threatening text messages to her and her daughter, telling her that her mother was a thief. After her employer started legal proceedings, the item in question turned up - at the house that was being renovated. Charges were dropped but her former employers never apologised. Magdalena's experience led her to look for support. She called on Caceh, a centre for supporting and training domestic workers, and they helped her through difficult times. At the end of August, the group successfully formed Mexico's first union for and run by domestic workers. Magdalena takes part in forums and workshops with her colleagues to help other people like herself. "Conditions for women who work in homes in Mexico are very precarious," says Marta Leal Morales, general secretary of the newly-formed National Union of Domestic Workers (Sinactraho). "We decided that this union would be to defend the rights of domestic workers, so they could have a better quality of life." According to the country's national statistics agency, Inegi, more than 2.3 million people are paid domestic workers in Mexico - 95% of them are women. Of that, nearly two million are maids. The rest are cooks, drivers, dish-washers and care-workers. It is a sector that is poorly regulated and even more poorly paid, with some workers receiving as little as $6 a day. The hope is that the new union will make people more visible and give them a voice. But domestic work is a hidden profession, most of the people work in the informal economy. According to the Conapred, Mexico's national council for the prevention of discrimination, more than 90% of domestic workers do not have a contract, so achieving change will be hard. Entrepreneur Rodolfo Corcuera has a different strategy but the same goal when it comes to making things better for domestic workers. Last year he and Ana Isabel Orvananos founded an online platform called Aliada - linking cleaners with clients near their home. Rodolfo came up with the idea after finding out his cleaner was commuting four hours each way to get to his house. She was spending so much time travelling, she could not earn a full day's wage cleaning houses. Aliada was the solution. The name means 'ally' in Spanish because Rodolfo says the relationship between cleaner and client should be equal. "This is not somebody that's working for you, it's another human being. "She's providing a service to provide for her family and she's helping you in your home and you're paying her for that," says Rodolfo. "It's very important, especially here in Mexico where we have a lot of discrimination, a lot of inequality, for everyone in our community to feel they are at the same level." Any potential worker who wants to join has to have a smartphone, a bank account and pay taxes. Once that is organised, they can sign up for as much work as they would like and on average, earn around $35 a day. Norma Flores Vielma is one of the 'aliadas' or allies. She lived and worked in Los Angeles for several years but the mother of four had to return to Mexico for family reasons. The flexibility she has of being able to choose when and where she works through Aliada - and the fact that it is not just clients that can give feedback on her work, but she can rate clients on how they treat her too - means she feels supported. "You're not just a domestic worker, you're someone who is allowed into peoples' houses," she says. "Not even a doctor goes into the bathroom and the bedroom but we do and that's something that's really valued." Her sister, in contrast, works 10 hours a day and gets paid less than $12. I ask Norma why she does not join Aliada too. She says that the cost of a smartphone is beyond her. For every Norma and Magdalena - women who are ensuring they get the rights they deserve - it is an uphill struggle for many more. With an informal economy that is so big and so hidden, there are plenty who will have to continue suffering in silence in the hope of getting paid.